These perfectly warm, protective Hetsra Kids' Ski Gloves use premium materials and design features for last lift chasers who choose to ski-on undeterred by freezing cold or blizzard conditions. 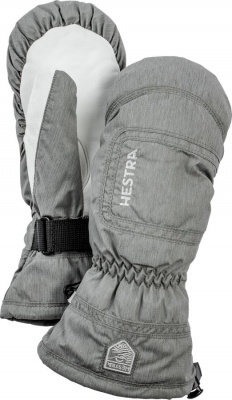 The Hestra Army Leather Heli Ski Jr uses durable leather and technical fabrics to keep hands warm while skiing. Perfectly warm for hand comfort in the depths of winter, the Hestra Army Leather Heli Ski Jr Mitt's use of premium materials and design features combine to create a superbly durable, protective Hetsra Kids' Ski Mitten for last lift chasers who choose to ski-on undeterred by freezing cold or blizzard conditions. Supple, very robust leather imparts excellent grip and longevity, waterproof Triton fabric supplies weather-proofed comfort and a removable luxurious polyester insulated liner provides a lavish supply of warmth. The Hestra Army Leather Heli Ski Jr Mitt is an outstanding Kids' Ski Glove that's built for complete Alpine comfort and to stand the test of time. Made with Hestra's most durable, yet supple Army Leather, the Hestra Army Leather Heli Ski Jr Mitt's palm provides exceedingly good protection in blizzard conditions, and exceptional dexterity for easy ski pole grip and active motion. Hestra's Army Leather is proofed preventing it become saturated or frozen, and it's superbly durable, capable of providing years of hand comfort skiing piste or powder. The upper section of the Hestra Army Leather Heli Ski Jr Mitt is made of wind and waterproof, very breathable Hestra Triton fabric for serious weather protection. 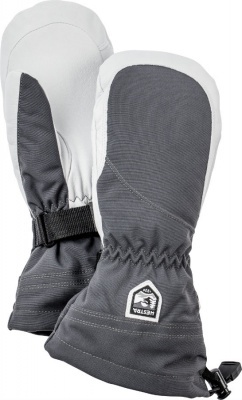 Inside these Hestra Kids' Ski Mitts there's a fleece-backed Bemeberg lining to snuggle hands into. Soft, high-loft fleece provides next-to-skin comfort, while the polyester insulating layer is low profile and thermally efficient for non-restrictive warmth. The Hestra Army Leather Heli Ski Jr Mitt's Bemberg lining is removable, so it can be taken out and dried quickly at the end of the day. 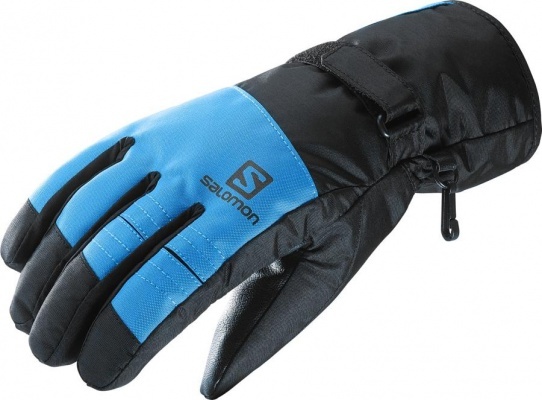 The Ski Mitten format holds the fingers together, improving finger safety and increasing warmth. The Hestra Army Leather Heli Ski Junior Mitt has a drawcord adjustable cuff that fits over the top the Ski Jacket sleeve, creating a neat, powder-proof barrier, and an elasticated wrist that provides a draft proof seal and a secure fit. The mini carabiner keeps these Kids' Ski Mitts together so there's less chance of losing one, Hestra Handcuffs - soft elastic wrist cuff and leashes - enable the Heli Ski Junior Mitts to be taken off without dropping them. 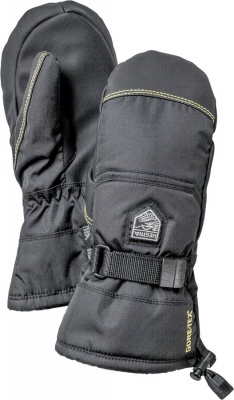 These Hestra Kids' Ski Mitts are built with a pre-shaped, curved design that follows the natural line of their hand gripping a ski pole, for skiing comfort and because they don't have an an additional waterproof insert and associated seam taping, they are inherently more dexterous than a standard waterproof Ski Glove. The removable lining and proven Hestra Heli Ski construction also greatly speeds up drying time, improves breathability and durability too. 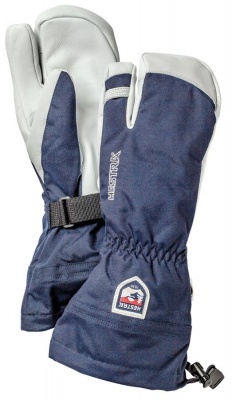 Demonstrating exceptional craftmanship, the Hestra Army Leather Heli Ski Jr Mitts are fully alpine-ready and able to withstand a lot of cold and wear; it's easy to see why you're so likely to see Ski Instructors wearing Hestra Ski Gloves this season. 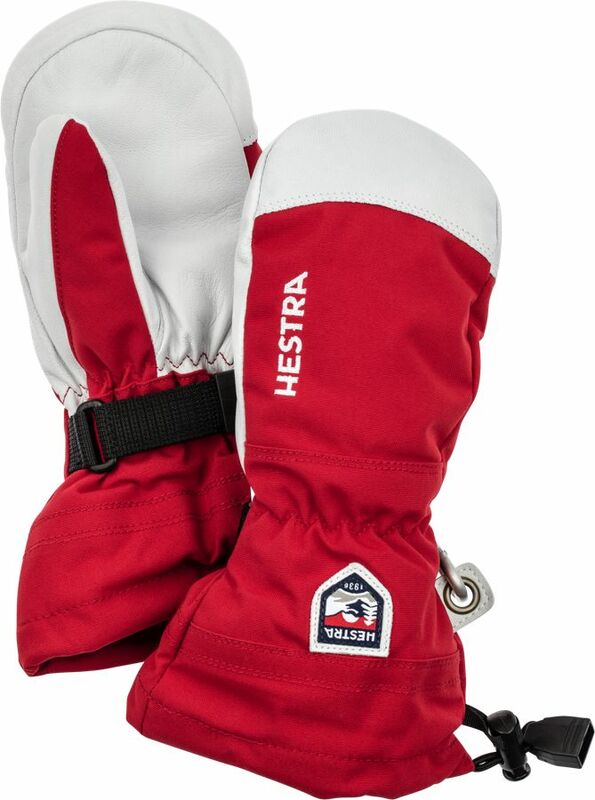 These premium Hestra Kids' Ski Mitts offer all the top performance of the adult Hestra Heli Ski Gloves, just in a size that fits the younger skiers of the family. Hestra Kids Glove Sizing Chart in ages.